Jason thanking his team and supporters at the Day Reporting Center’s appreciation luncheon last Friday along with the Center’s Director, Becky Hogamier. I first met Jason in February 2017 when he was sentenced to participate in the Washington County Day Reporting Center (DRC). 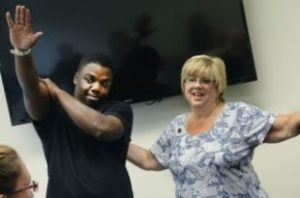 Washington County Sheriff’s Office’s Day Reporting Center is alternative to incarceration: an on-site, nonresidential program designed to change participant’s thinking patterns and attitudes, improve job skills, find employment and/or keep that job. This was the beginning of a long and (I suspect) scary journey for Jason. He was being thrust into a world that he was not familiar to him – Jason had always survived on his own and had little to no support system at home. Now, at the DRC, he was being asked to participate in groups, work with case managers, share his feelings, make a plan, and be an active participant in his recovery. For many, such an ask would be overwhelming, but not for Jason! He accepted the challenge with a smile on his face and a pep in his step. Faced with homelessness shortly after beginning services at the DRC, Jason embraced his support network and moved into a sober living home with Ladders for Leaders. 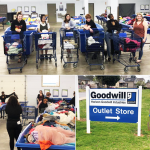 Jason attended our Goodwill’s Get-Onboard! class that we host right at the DRC and then he transitioned to our paid work training program at the Main Goodwill campus on Pennsylvania Avenue. While he was in paid work training, Jason continued to meet his programmatic expectations at the DRC and remain active in his recovery. And, he didn’t stop there. In June 2017, Jason participated in and completed our Goodwill forklift certification class. This class was the final piece of the puzzle that Jason needed to obtain full time competitive employment. Jason was hired by the National Golden Tissue Company as an overnight forklift driver in their warehouse on Longmeadow Road. It is a change in schedule – being up all night and still having to commit to program and training during the day – and those of us that are a part of Jason’s circle of support, well, we were excited and nervous for him at the same time. Congratulations to Jason on your 1 month anniversary of full time employment — we look forward to many more!